All Nippon Airways and Lufthansa have allocated the four lucrative slots they collectively received for service to Tokyo's Haneda airport. All four slots will be used to shift existing services at Narita to Haneda, although ANA will add a Narita-Dusseldorf service independent of the Haneda slot allocation. This will further grow ANA and Lufthansa's share of the Germany-Japan market to 89%, with the balance held by Japan Airlines. Of the 11 Haneda slots awarded to ANA, only five will be used for new services while five replace Narita services and one slot (to China) remains unallocated. This is a better result than European carriers, which received six slots but will use only one for new growth. Overall the Japan-Europe market will grow 4% in northern summer 2014. ANA is driving growth, but this is hard to pin on its success in receiving Haneda slots; theoretically the growth could have occurred without the slots. Whether or not limited Haneda slots offer a serious constraint, the next two fastest growing carriers in the Japan-Europe market are Turkish Airlines and KLM, which received no Haneda slots and are not part of a joint venture. ANA and Lufthansa will use the two Haneda slots they each received by transferring their Narita services to Haneda. ANA is moving its daily Narita-Frankfurt (777-300ER) and Narita-Munich (787-8) services to operate out of Haneda. There will be no aircraft changes. This will be ANA's second daily Haneda-Frankfurt service (complementing an existing 787-8 service) and first daily Haneda-Munich service. Lufthansa likewise is moving its Narita-Frankfurt and Narita-Munich services to operate out of Haneda. The changes are effective 30-Mar-2014. Lufthansa will also extend its Frankfurt-Osaka Kansai service to Tokyo Narita to maintain a passenger presence at Narita and help the Kansai route. There will be no change from this extension in Lufthansa's overall Japan-Germany capacity. The allocation of all four Germany-Japan Haneda slots to ANA and Lufthansa - effectively one entity because of their anti-trust immunised JV - was one of the most contentious parts of the Haneda slot allocation that favoured ANA. Separately, ANA from 30-Mar-2014 will launch a daily 787-8 service from Narita to Dusseldorf. This is the first Japanese service for Dusseldorf, which has the largest Japanese community in Germany (one of the largest in Europe) and is also home to a sizeable Lufthansa Group presence, facilitating onward connections. ANA's service will grow the share of capacity it and the Lufthansa Group control between Japan and Germany from 87% to 89%. ANA's service is the second Asian flight, with the first being Air China's five weekly (three in winter) A330-300 service from Beijing. Emirates and Etihad also serve Dusseldorf. ANA's allocation of its German slots nearly completes its full allocation. All that is outstanding is its one daily slot to China, the use of which is subject to negotiations with China owing to congestion at Chinese airports. Of the 14 slots distributed to foreign nations, six went to European nations: two to each of England, France and Germany. Five of the slots will be used to shift Narita services to Haneda; British Airways will use the sixth slot instead of its existing late night/early morning Haneda slot and consequently will grow overall Tokyo capacity. Air France will grow Paris-Tokyo services to three daily (two to Haneda, one to Narita) in northern summer 2014, up from two daily (both to Narita) in summer 2013. While this appears to represent overall growth, capacity change is little as Air France cannot deploy its A380 at Haneda as it does to Narita. So even with two Haneda slots, Air France is forced to have a Narita service in order to maintain its previous capacity level. The Japan-Europe market will grow about 4% in the peak of summer 2014 compared to 2013. ANA, British Airways, KLM and Turkish Airlines have noticeable increases in capacity while JAL and Lufthansa have noticeable decreases. ANA in summer 2014 will become the largest carrier between Japan and Europe whereas in summer 2013 it was fourth, behind Lufthansa, JAL and Air France. 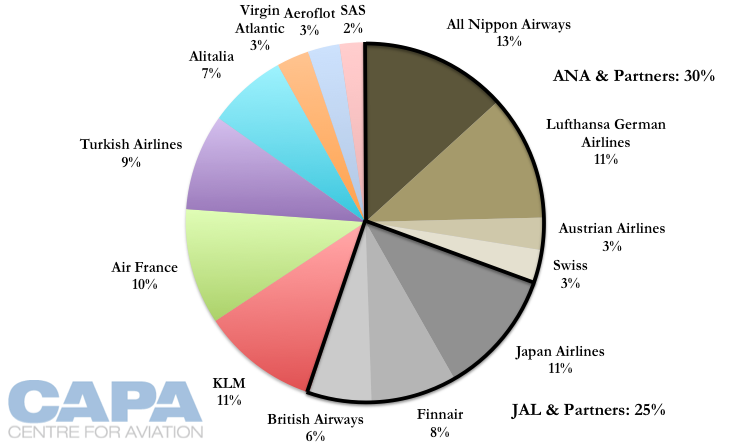 The ANA and Lufthansa-led JV between Japan and Europe will have about the same market share in summer 2014 as from a year earlier. But within the JV, which also includes Austrian and SWISS, the individual market shares are changing. ANA's share will increase about 2ppt to 13% as it adds a daily Haneda-Paris CDG and Narita-Dusseldorf service. Lufthansa's share is decreasing as it moves its non-stop Narita services to Haneda. Lufthansa in summer 2013 operated a daily A380 Frankfurt-Narita service but will have to use a 747-400 for Frankfurt-Haneda as Haneda has restricted the A380 during daytime operations.The airport requires greater air traffic separation for the A380, which would impact Haneda's tight operating environment. Air France has also been impacted by the A380 restriction. It will end its Paris-Narita A380 service in favour of higher frequency at Haneda. Japan Airlines and British Airways initiated a joint venture, extended in 2013 to include Finnair, which has more capacity to Japan than BA. Their joint share of the market is also relatively unchanged, and overall the two JVs will have about the same market share in 2014 as in 2013 despite the changes and opportunities brought from the new Haneda slots. But as in the ANA-Lufthansa JV, individual carrier shares within the JV will change. BA's share will increase as it ramps its Heathrow-Haneda service to a daily offering. JAL's share will decrease as it will down-gauge its Moscow service from 777-200 to 787-8 while there will be capacity decreases elsewhere in Europe as JAL further deploys aircraft with a new cabin configuration that is less dense than its predecessor. Finnair's capacity is unchanged. This is a reversal of the ANA-Lufthansa situation, in which the Japanese carrier grows while the European carrier shrinks, but the exact reasons for each carrier's change in the two alliances is very specific, and justified. Two of the three biggest capacity changes in the Japan-Europe market in 2014 are however coming from carriers that are not impacted by the Tokyo Haneda slot distributions as they were not offered any slots: KLM and Turkish Airlines. Turkish Airlines is making the second largest gain in the market (first is ANA) as it increases Japan services from 14 to 21 weekly. Istanbul-Osaka Kansai remains a daily service while Istanbul-Tokyo Narita increases to a double daily (A330/777-300ER) service. KLM is expanding in Japan as it grows its Amsterdam-Fukuoka service, launched in Apr-2013 and the sole non-Asia flight from Fukuoka. The flight gains a frequency as it grows from three to four weekly services. Amsterdam-Osaka Kansai will be up-gauged from a 777-200 to 777-300ER while Amsterdam-Tokyo Narita will see more 777-200 services than lower-density 747 Combi services, according to OAG. Notably neither of these carriers is part of a joint venture between Europe and Japan. Turkish Airlines does however have ANA as a partner, and there are limited Turkish codeshares on ANA metal. Lufthansa is understandably not keen to encourage Turkish's effectiveness in the Asia-Europe market, having recently cancelled all codesharing on Turkey-Germany routes, where it considered Turkish was being too aggressive on pricing. KLM has no local partner and would like one: ideally JAL, with whom Air France partners, but this relationship has not yet evolved, as CAPA previously wrote. Ironically, most of the growth in the Japan-Europe market is a result not of new Haneda slots - mostly becoming replacements for Narita - but from competitive carriers like Turkish Airlines and KLM seeing opportunities. ANA has grown its European capacity by about 29% since the Haneda slot allocation. Only one new service (Paris) will use a Haneda slot while the second new service, Dusseldorf, will operate out of Narita. It is difficult to say if the ease of Haneda for some services supports new services elsewhere that could not have eventuated without Haneda slots. The full view of the Haneda slot allocation must consider revenue growth, and if a premium can be obtained from using Haneda slots as compared with Narita. More difficult to quantify is if Tokyo becomes a more favoured business destination with easier airport access. The picture is rosier for Tokyo when considering the regional Asian impact from Haneda slots. ANA and its foreign peers are so far mainly using the slots for new services to Haneda, not replacement of ones from Narita. This fits Japan's original objective with Haneda slots. Japan may have been torn in allocating slots between its slow-to-no-growth established partners and its growing partners where relationships are newer.